Big Sur is one of the most beautiful places on Earth. This stretch of coastline between Carmel and San Simeon is best known for its dramatic scenery and terrain where turquoise ocean waters crash into rugged cliffs and mountains which rise from the sea. It doesn’t make sense how something so beautiful can remain mostly untouched for so long. Whether you visit for one day or one year, there will always be something new to discover. It’s all here from waterfalls, parks, hiking trails, beaches, iconic bridges dating back to the early 20th century, and scenic vistas. 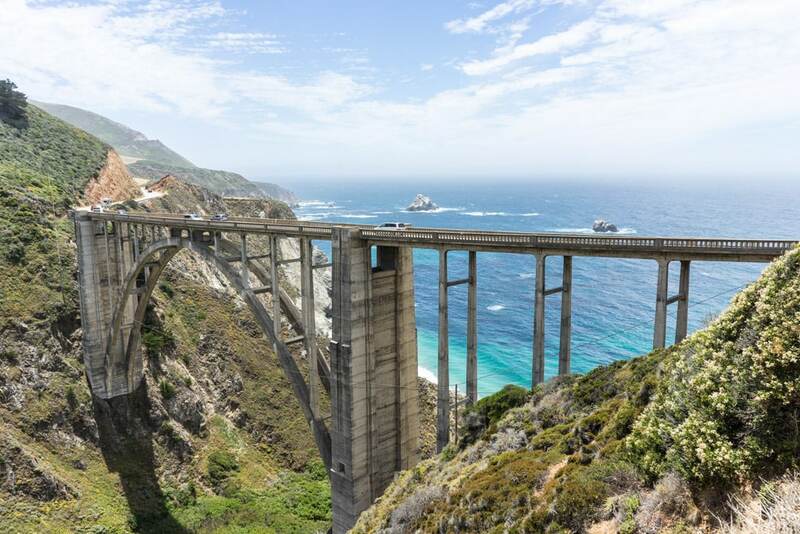 If you are traveling between San Francisco and Los Angeles, the detour through Big Sur is well worth the effort and extra time along the meandering road. 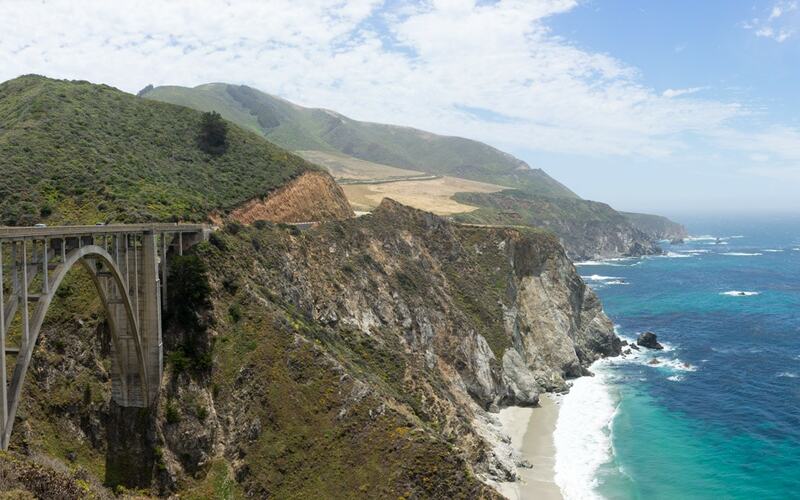 Taking a road trip down Highway 1 as it cuts its way along the Big Sur coast should be on everyone’s bucket list. Here is a list of 7 of my must see sights along Big Sur that you should not miss. A short walk off Highway 1 in Julia Pfeiffer Burns State Park brings you to McWay Falls, one of the most iconic spots along the Big Sur coastline. What makes McWay Falls so special is how the 80-foot waterfall empties into the Pacific Ocean. The water flows off a rocky tree lined cliff down to the golden beach below. The beach is surrounded by swirling blue and turquoise pools of water and crashing white surf. I can’t think of anything more picturesque. If you love photography then this is your spot. You will leave with that perfect postcard photo, even if you just use your cell phone camera. Just make sure your camera battery is fully charged for all the photos you will take. Access to the beach below is illegal since the cliffs are unstable and dangerous. With several great photo opportunities on the trail above, there’s no reason to risk your life trying to descend down the cliffs. Parking is available for $10 at Julia Pfeiffer Burns State Park or for free along the shoulder of Highway 1. Many visitors to Julia Pfeiffer Burns State Park are so enchanted by McWay Falls that they fail to realize the wonderful and rugged backcountry that surrounds them. The highlight of this backcountry is Ewoldsen Trail. This trail is a moderate 4.5-mile hike through quiet redwood groves along McWay Creek before that leads to a viewpoint with stunning views of the Pacific Ocean. If you enjoy photography, you can literally spend all day here with almost endless photographic opportunities. If you continue for about a mile from the parking lot, you will arrive at a junction. From here, the trails loops for about two miles through redwood forests and rolling grassy ridges through McWay Canyon. If you are limited on time yet want to reach the viewpoint, head clockwise at the loop junction. The trail is steep but only takes around 15 minutes to reach the top. It’s well worth the effort. You can head back down the same way or continue around the loop to get the full experience. The whole loop takes about 60 to 90 minutes without stopping. Just 30 minutes south of Monterey and Carmel is Bixby Creek Bridge, one of the most photogenic, iconic, and dramatic views along the Big Sur coast. Even if you have never been to Bixby Creek Bridge, you know Bixby Creek Bridge. The bridge is one the most photographed spots in California and has been featured in movies, television shows, and commercials. The bridge, which opened on November 27, 1932, is one of the highest single span bridges in the world. The massive concrete arch bridge spanning Rainbow Canyon, surrounded by rolling hills and turquoise waters, is one of the most beautiful sights I have ever seen. For the perfect photo op, pull over at the viewpoint on the northern end of the bridge. A small parking lot with free parking is available. Have you ever noticed a dirt road that leads up into the hills from the northern side of Bixby Creek Bridge? You probably haven’t. Most tourists traversing down Highway 1 never notice this rewarding detour. They snap a few photos at the viewpoint for Bixby Creek Bridge, which is still beautiful, and move on. Little do they know they are passing by one of the most scenic roads along Big Sur. This little known road is Old Coast Road. Before Bixby Creek Bridge was built, travelers had to traverse on an 11 mile inland dirt road that could take days to complete. From Bixby Creek Bridge, Old Coast Road surprises travelers with redwood forests, rolling hills, and views of the Pacific Ocean. The road continues until it reconnects with Highway 1 near Andrew Molera State Park. Since Old Coast Road is a narrow dirt road, a four-wheel drive or high clearance vehicle is highly recommended. If you drive slowly in a smaller car, you should be able to drive along the road, but I probably wouldn’t recommend this. In any case, if it’s raining or recently rained, be sure to stick to the asphalt of Highway 1. For the better part of the 11-mile detour, you will be passing through private land. With limited areas to pull over for photos, I found myself stopping in the middle of the road to snap a few photos. Since not many cars use this road, you should have no problems, just keep an eye out for other vehicles. Just avoid walking in any private areas. The multiple signs will frequently remind you to stay out. Even though Pfeiffer Beach, not to be confused with Julia Pfeiffer Burns State Park, is located down a poorly marked and narrow unpaved road, the scenery is worth the trek. It’s one of the most beautiful beaches located in Big Sur. You don’t come to Pfeiffer Beach for the swimming. It’s too cold and the rip tides are too dangerous. You come here for the scenery and to relax on the beach. Photographers will enjoy taking pictures of the perfectly positioned rock formations in the water. The best time for photographs is right when the sun is setting and the beach, ocean, and rocks are fully lit with golden yellow and fiery red shades of color. If photography is not your thing, the beach is still a prime location for walking, exploring the tide pools, climbing on the rocks, and relaxing before continuing along on Highway 1. It’s the type of place you don’t mind getting lost for a few hours. Kids will love Pfeiffer Beach. Parking at Pfeiffer Beach is available for $10. If the small lot is full, which often occurs, you will have to park up by the highway and walk in. Point Lobos State Natural Reserve, located at the northern end of Big Sur near Monterey and Carmel, is a great option for ending or starting your road trip along Big Sur. Point Lobos State Natural Reserve can be described as Big Sur in a small package. This means that if you don’t have time to travel along the entire Big Sur coast, you can still get a great idea of what the rest of the coast looks like without having to drive for hours. The reserve features rocky shores, coves, and rolling meadows surrounded by stunning views of the ocean. Nature and animal lovers will be able to see everything from birds, to seals and sea lions, and even migrating gray whales in the winter. My favorite part about Point Lobos State Natural Reserve are the hiking trails that meander around the park and along shorelines leading past endless hidden coves and cypress trees. Parking at Point Lobos State Natural Reserve is $10. Just south of Pfeiffer Beach is Nepenthe Restaurant and Cafe Kevah, a popular stop along Big Sur for food, drinks, and the stunning views. Nepenthe Restaurant serves upscale and overpriced classic California cuisine. Located downstairs is the more reasonably priced, but still expensive Cafe Kevah. The cafe serves brunch, baked goods, salads, and paninis. You pay for the view. Nepenthe Restaurant and Cafe Kevah are easy to spot. Just look for the high concentrations of vehicles pulled over on the side of the road. It’s always busy here, even on a Monday afternoon. While I can’t actually recommend the food since I’ve never tried it, I do recommend making a stop for the spectacular views of the rocky Big Sur coastline and the Pacific Ocean below. Order a cold beer or glass of wine and sit back and enjoy the awesome views.